A fantastic one man hole digger for drilling clay. Features a 13:1 medium speed gear ratio and revolves at 277 RPM. Post hole digger features a powerful Honda engine with 8-inch semi-pneumatic tires, roll cage, and 13:1 transmission. Auger not included. This Little Beaver post hole digger is a fantastic one man hole digger for drilling rocky ground or clay. It features a 13:1 medium speed gear ratio and revolves at 277 RPM. If you are installing fence or using the horizontal boring option to dig under a driveway, the possibilities are endless. 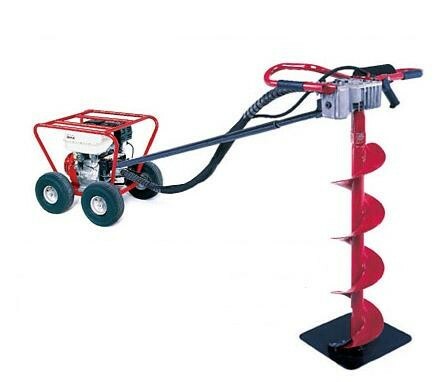 Includes a roll cage that will transport your auger digger smoothly over any manicured lawn. 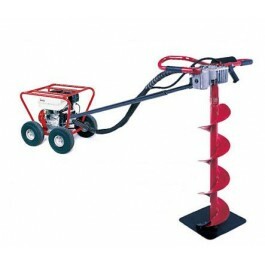 This auger is a one of a kind piece of equipment that will last you a lifetime. Post hole digger features a powerful Honda GX-160 OHV engine with 8-inch semi-pneumatic tires, roll cage, and 13:1 transmission. Auger not included.